Got Mcdonalds cravings? Don't fear, new coupons will become available in a few days! There will be new coupons available starting Monday, May 9 and Tuesday May 10 if you are in Alberta, British Columbia, Manitoba, Saskatchewan, Northwest Territories, or the Yukon. 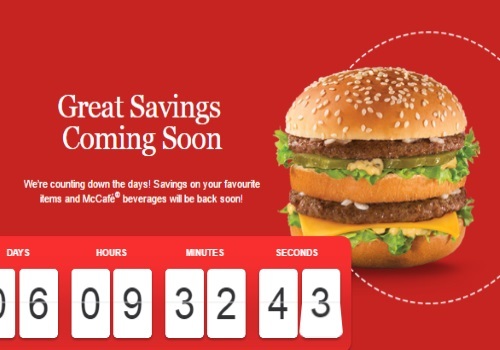 As always these coupons are available for print, or can be shown on your Mcdonalds app, they also mail them out around the same time too, so check your mailbox. Coupons expire June 5 in New Brunswick, Newfoundland and Labrador, Nova Scotia, Ontario and PEI and June 12 for Alberta, British Columbia, Manitoba, Northwest Territories, Quebec, Saskatchewan and Yukon.